ClickThai Map of Thailand as seen on www.clickthai.de as a plain PDF file. This map was created in 2000-2001 and is no longer quite so fresh as a daisy. Nevertheless, it is ideally suited as offline map to explore Thailand. With the extensive index you can quickly find larger towns and attractions. The CD-based version, which you can order here, is almost identical to the online-version and contains only HTML pages to be operable on all operating systems. It contains the PDF version too. 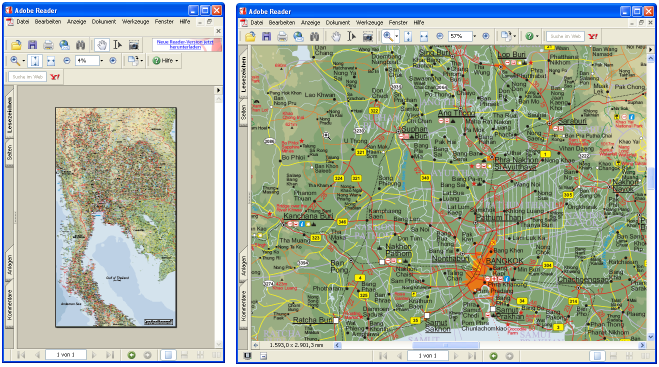 and print wall-size maps in the original size (2.9 x 1.6 m or 9½ x 5¼ ft.) or even larger. The staff at your local print shop would love to hear from you.